I’ve just finished updating my website from old to new. I’ve upgraded my website so I can have the ability to add new work portfolio pieces to the site and update the graphics a little bit. The old website had been up and running since 2007. I booted up the waybackmachine and had a trip down memory lane on my older websites. I had almost forgotten that I had built and even earlier one in my youth with dreamweaver and notepad. This one was called ‘JamesPrankardInc’ (as being incorporated when you were 15 sounded cool, and doesn’t make you sound like douche at all). This old website had been running since 2005 and I was surprised to see what I managed to achieve back then with little or no programming experience. It even had a banner game (which I can’t seem to get perfect score anymore). I even decided to re-draw all my friend websites logos and colour them into the same hippie colour as my website. 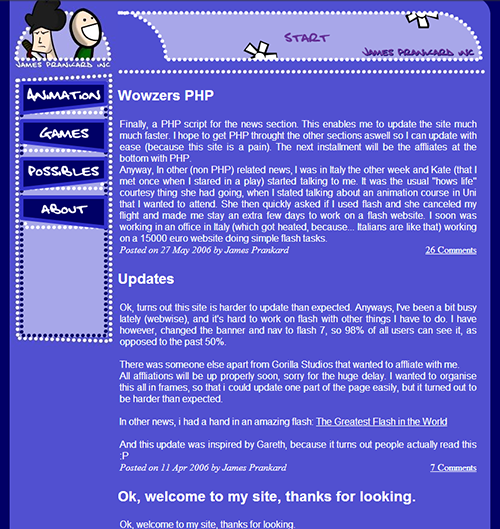 The old website was custom made PHP and CSS. Which wasn’t bad considering I had put it together learning HTML and PHP at the time. The new website is build from WordPress for a blogging platform (as you can see here), which is much easier and safer than trying to build your own.